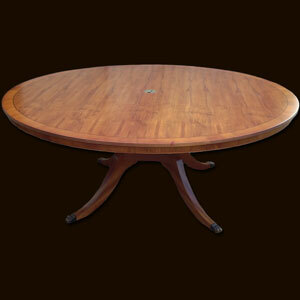 Ref: besp15 Using items from our dining table range, we were asked to create this impressive circular dining table. The requested spec included; large 72" diameter, superior figured yew wood with inlaid line and a central recessed cable management system. The base was hand made using 4 turned columns and splayed legs to allow for cables to be routed to the centre of the table.